As Comic Con enters its second day, the gloves come off and the stakes rise. More people, more panels, and more adventures to be had. 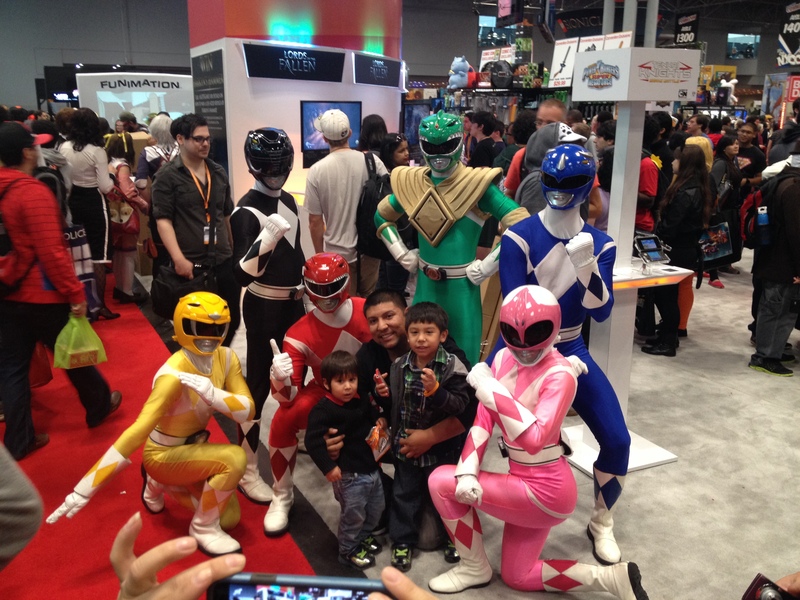 So let’s round up everything we got from Friday of New York Comic Con 2012 – Day 2. As I started to explain with my Day 1 review, Artist Alley is a treasure trove if you take the time to look. Today I found an absolutely amazing artist by the name of Terry Huddleston. 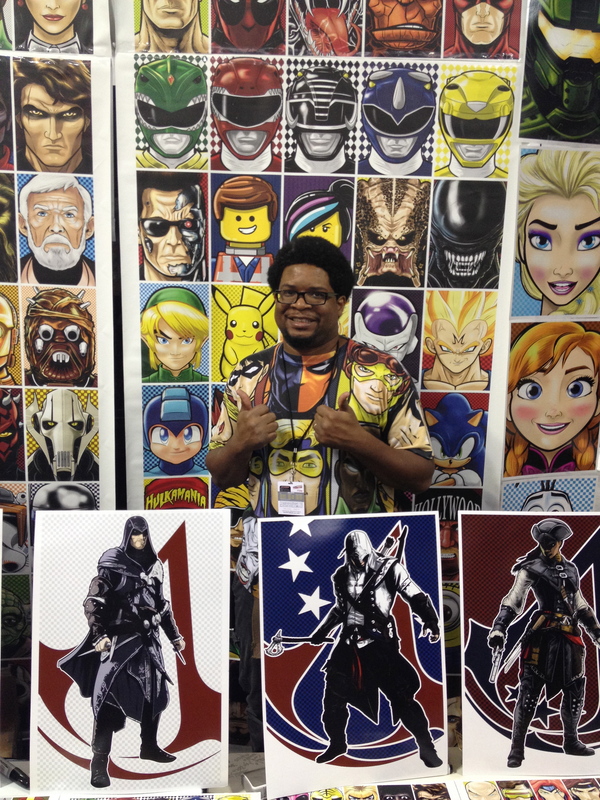 From Assassins Creed to Dragonball Z and Power Rangers, this man has an array of different works of art each more fantastic than the last. Throw in a hilarious personality and you’ve got a definitely booth to check out towards the back of Artist Alley. Though don’t stop there, be sure to explore the rest of Artist Alley to find more great artists – even though of the cosplay variety. I stumbled across LeeAnna Vamp – an awesome cosplayer who will eventually be featured in full here – who was taking time to meet fans and show off some prints and cosplays. So seriously, go check out the Alley. You never know what you might find but it’ll always be awesome! Have you ever found yourself thinking “Why were old game cartridges so large?” Sure you could blame the technological drawbacks of the time; or maybe you figured that they’d make better excellent flasks on day… That’s right, you heard me. FLASK! Imagine if some of your favorite Super Nintendo games were actually remade as flasks. 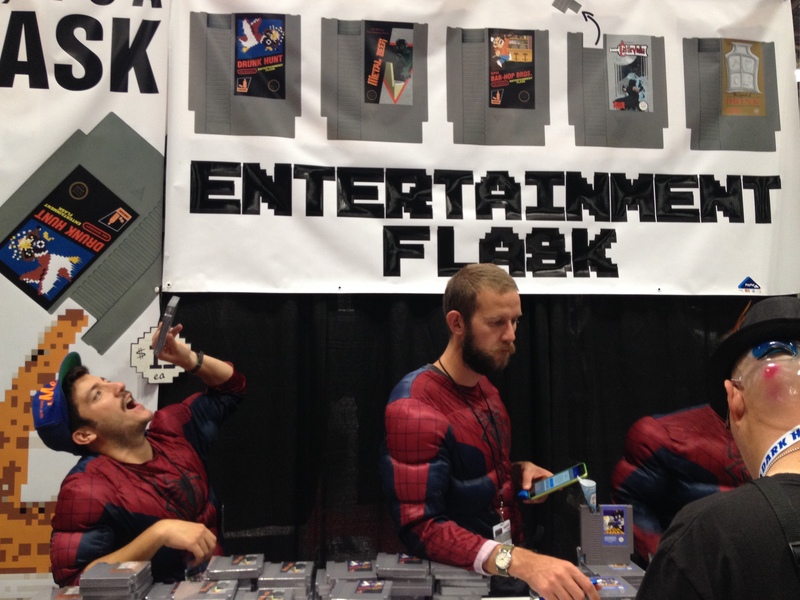 From Metal Gear and Duck Hunt to Metal Beer and Drunk Hunt, that is exactly what Entertainment Flask does and they are at this years comic con! 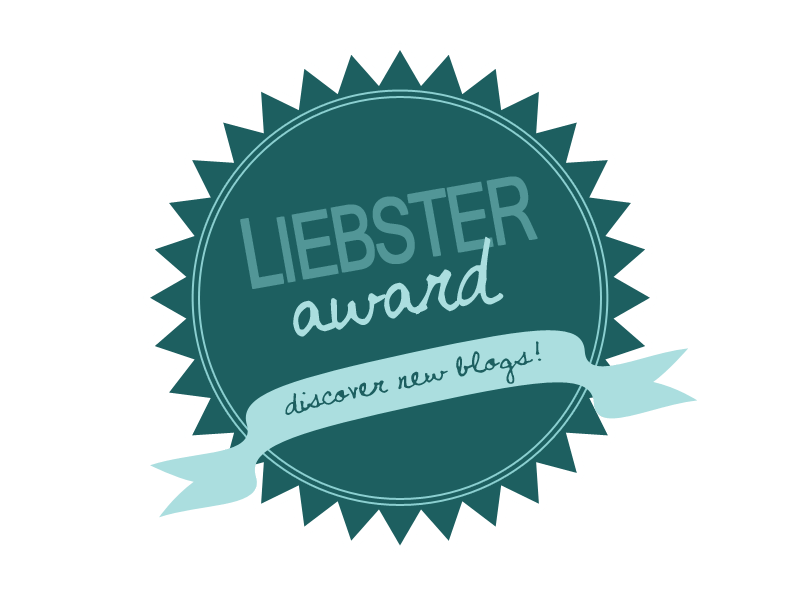 So go check them out and get this hilarious gift for yourself – or friends. Ubisoft might not have any park our courses at NYCC like they did SDCC – for obvious reasons – but they did partner up with The Next Level to bring competitive game play to the scene. And when you mix cosplay with competitive gaming, fun stuff is bound to happen. Sure the Black Flag multiplayer was awesome as were everything else; but it’s not a Con until you have a Spiderman dancing on stage with a bunch of other cosplayers. So thank you again Ubisoft and The Next Level for making us … well …. just dance! If you thought the only good Marvel panels were movie ones, you’d be wrong. The Marvel animated universe actually takes place in a universe very similar to the Phase 1 story and is honestly just loads of fun. As such, the Marvel Animation panel today unveiled some sneak peaks at Season Avengers Assemble and Ultimate Spiderman Web Warriors; but the the real fun started when we got to see an entire episode of Hulk and the Agents of SMASH. As someone who’s never watched this before, I was very impressed with the format as well as happy that the animation quality/voice actors remained constant with the other animated universe installments. Thought the biggest unveil came with some secret test footage of an animated series for Guardians of the Galaxy. As you can see from the footage, the characters look more closely based on their Marvel Cinematic Universe version than the preexisting versions in the Marvel Animated Universe; and I’m perfectly ok with that. It looks as though this story might explore some origins stories as well; but I’m really in love with the animation style, which has a very Batman Beyond feel. Regardless this was loads of fun to be a part of. 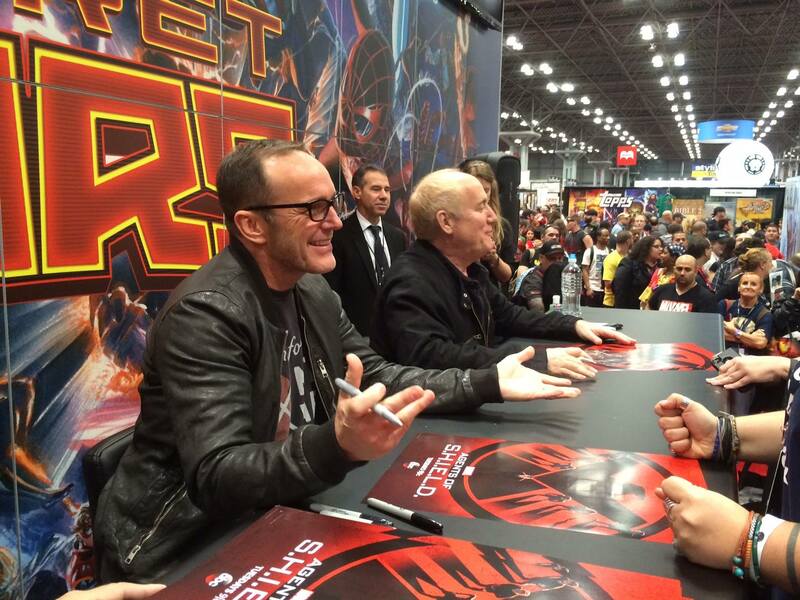 Keeping with the Marvel theme, Clark Gregg (aka Agent Director Coulson) stopped by to sign some autographs at the Marvel booth for some lucky fans. Again, not all signings take place in the autograph hall so you want to make sure you explore to the best of your abilities so you’re not left out in the dark. More than anything else, Friday signifies the kick off of ‘family trips’ to Comic Con. There are kids everywhere and the only thing better than family togetherness is seeing how the kids light up in seeing some go their heroes in real life. One group seems to do that better than others and that is the Power Rangers. Last year I saw a bunch of Megaforce Rangers who’s costumes were spot on. This time around Mighty Morphin took the stage; and the smiles on peoples faces were one of the most charming things of the day. So kudos to these heroes. Speaking of which, Day 2 of Comic Con means even more cosplays; and the cosplayers did not disappoint! Here are all the highlights from Friday – Day 2 – ; and as always, if you see yourself or someone you know, please share/let me know. Enjoy! This Gwen Stacey and Spiderman are simply uncanny! It’s this month’s Cosplayers of the Month, Straight Line Association!! !